When Park Geun-hye became president of South Korea earlier this year, there was a sense of unease among many that the election of a dictator's daughter represented a step backward for the country's three-decade old democracy. The surprise resignation of Prosecutor General Chae Dong-wook earlier this month contained vague echoes of the "Saturday Night Massacre" in the United States, when two senior Nixon White House aides resigned in protest after the disgraced president ordered the dismissal of Watergate special prosecutor Archibald Cox. The country's lead prosecutor had drawn the ire of conservatives—including some in his own Justice Ministry—by indicting the powerful former head of the National Intelligence Service (NIS), Won Sei-hoon, for interfering in the Korean presidential election last year. According to the indictment, which was handed down in June, Won directed nine members of the agency to post over 5,000 online messages attacking the opposition Democratic United Party (DUP) and its candidate, Moon Jae-in. 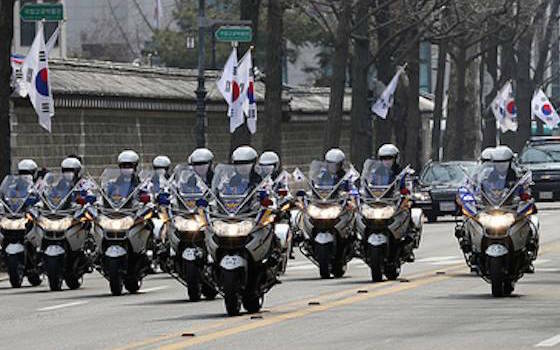 Seoul Police Chief Kim Yong-nam was also indicted for withholding evidence related to the case. More recently, Chae ruffled feathers by going after the successor and protégé of Park's father, Chun Doo-hwan. After seizing power in a coup following Park Chung-hee's assassination in 1979, Chun ruled the country until massive street protests forced him to step down and call elections in 1987, marking Korea's shift to democratic government. He was later convicted on charges of bribery and corruption and sentenced to death. Pardoned in 1997 by President Kim Dae-jung, the former military dictator has since been comfortably living out his days supported by the illicit fortune that he amassed during his time in office. Partially due to renewed pressure from the prosecutor general's office, Chun's family recently agreed to pay the outstanding $156 million in fines that resulted from his conviction. Chae's willingness to pursue such cases won him few friends in the conservative establishment, and ultimately led to his resignation. It will be the response to the lingering NIS scandal, however, that shows the true colors of Park's government. Originally established by her father as the Korean Central Intelligence Agency and used to suppress internal dissent, the NIS saw much of its power curtailed after South Korea's transition to democracy, particularly under the liberal administration of Roh Moo-hyun. In 2003, Roh placed a human rights lawyer, Ko Young-koo, in charge of the NIS, charging him to "set the agency straight." Ko subsequently transferred many of the agency's domestic intelligence gathering programs to other governmental departments, or simply had them eliminated. After a conservative government returned to power with the election of Lee Myung-bak in 2007, the NIS began to enjoy a revival of sorts. That revival has included an admission of monitoring the Gmail accounts of South Korean citizens and keeping tabs on domestic opponents of Lee's policies, particularly the Four Rivers Project and the U.S.-Korea Free Trade Agreement. The agency was also behind the controversial leaking last year of the 2007 summit transcripts between Roh and North Korean leader Kim Jong-il, which many viewed as an attempt to damage the DUP on the issue of national security in advance of the election. After revelations about former director Won's unlawful interference in the 2012 election came to light, there was broad-based agreement that action needed to be taken, with Park herself stating that she would "realize without fail a reform of the NIS, as demanded by the opposition." Momentum for these much-needed changes quickly stalled, however, as the country became embroiled in a scandal stemming from alleged pro-North Korean statements made by a member of the Unified Progressive Party (UPP), a small left-wing party comprising 13 of the 300 seats in the Korean National Assembly. On August 28, just two days after Park's pledge for reform, the NIS released transcripts purporting to show Representative Lee Seok-ki praising the North Korean leadership and making plans to launch an armed rebellion within South Korea if war broke out with the North. These remarks came at a May meeting of UPP members, when tensions were running high in the wake of the North's third nuclear test. Lee has since been arrested on sedition charges, and there are now calls to disband the UPP under the country's National Security Law. Members of Park's Saenuri Party, which holds a majority in the legislature, are already using the scandal as an excuse to water down reform measures for the NIS, aiming to protect its domestic intelligence gathering and anti-communist investigative authority. For her part, Park has backed away from her previous statements, rejecting participation by the National Assembly in the reform process, and preferring to let the agency offer up its own plans for change. In the middle of this storm is Prosecutor General Chae, who stepped down after his boss, Justice Minister Hwang Kyo-ahn, ordered an ethics investigation based on the Chosun Ilbo allegations. Because of the timing and the level of personal detail contained in the article, there is rampant speculation within South Korea that the NIS may have coordinated with the newspaper to release the story as a way of damaging Chae for leading the charge against the agency's former director. Opposition leader Kim Han-gil went so far as to claim that Chae was "a thorn in [the] side" of the president, and was forced out by the government. Coupled with the timing of the Lee allegations, which occurred just one week previously, it would appear that the NIS has no intention of going down quietly. As the leader of a country that is barely a generation removed from an era in which the state security apparatus was used primarily as a way for dictatorial leaders to maintain a tight grip on power, President Park is facing a crucial moment for her young presidency. Will she commit to the kind of reforms necessary to rein in the NIS and keep the agency from meddling in domestic politics? Or will she opt for superficial measures that serve to reinforce the opposition's view of her as the repressive "Yushin Princess"? Park's choice will be a key bellwether for the remainder of her five-year term, signaling whether Korean democracy is allowed to progress, or if she intends to put the country on a path back toward its darker, authoritarian past.